Her unique experience as an accomplished, International senior executive, extreme adventurer, published author, philanthropist and public speaker instills her clients with confidence and courage to step out of their comfort zone and step up to inspiring leadership. Ania works with executives in a number of sectors globally. Among recent clients are: ACCA, Pernod-Ricard, Standard Chartered Bank, HSBC, UBS, Eaton, AMEX, Teleflex and Entrepeneurial CEOs as well as CEOs of various charities. Team coaching of Trading and Sales Leaders: transition from ‘A’ class individual performers to team leaders; removing limiting beliefs and instilling what is actually possible. Organizational Transformation Leader: improving her personal influencing strategies and organizational profile to move a large finance organization from apathy into action. Team coaching of Senior Sales Leaders: transforming mind-set from ‘me’ to ‘team’ and creating a growth engine for the firm. Head of FISC Middle Office: developing a coaching leadership style and a vision for a new function in a complex matrix organization. Triple entrepeneur: clarifying his personal and multi-business vision to lead teams into the unknown with confidence; being unstoppable and drawing on the passion of an ex-top league athlete. Executive Head Hunter: re-setting thinking for unlimited professional growth resulting in increasing fiscal productivity by 40%. CEO of a large charity: leading a turnaround, engaging volunteers, creating a compelling vision, prioritizing key initiatives and most of all – making things happen. Team coaching of Senior Sales and Marketing executives: clarifying their pan-European strategic thinking and increasing team cohesion. 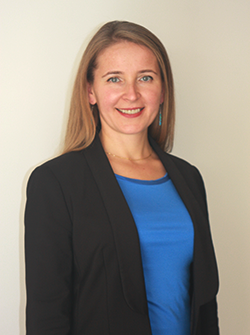 Ania is passionate about personal transformation; she gives inspirational and keynote talks. She re-charges in nature and very high mountains. She is writing her second book. Book: Why the hell Bother!? How climbing the Seven Summits changed my life. Ania has a unique approach of unlocking human and leadership potential. She inspires people she works with to be at their best. By assisting executives in recognizing their natural talents and authentic styles, providing them with distinctions of what limits their performance and providing them with language that transforms their environments, her clients significantly improve individually as well as their team’s performance.